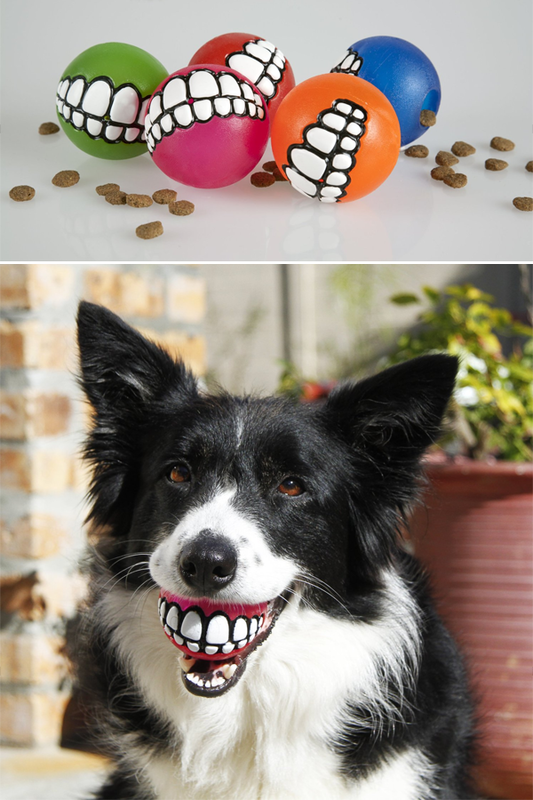 Choose from a variety of colors in this cute, amusing, and one-of-a kind treat ball for your dog! The soft material is soft enough to not hurt your dog’s teeth, but durable enough for multiple sessions of playing fetch. Throw the ball and watch your dog return it with a goofy smile in it’s mouth. Literally! A small hole in the back of the ball holds a treat for your dog for further fun. Taking your dog out for a walk and a game of fetch is always an easy task, but what about when your dog comes home with those dirty paws? The best solution to this problem is the Paw Plunger! It’s easy and simple to use: just fill the plunger up with water up to the top row of bristles and place each paw, one by one, inside the plunger. The bristles will gently, yet effectively clean off the dirt from your dogs muddy paws. You can say goodbye to the days where your dog comes home and rubs its paws all over your floor and furniture! 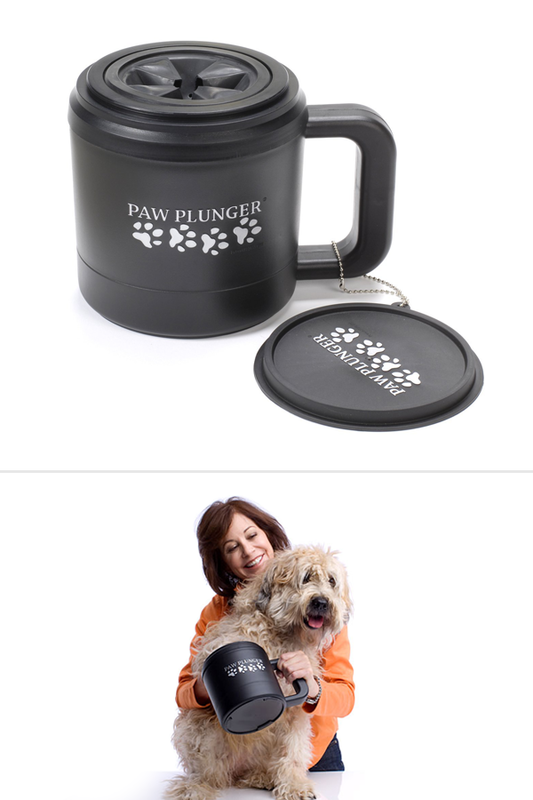 Once you start using the Paw Plunger, you’ll never have to deal with any bothersome paw-cleaning again. Available in 3 sizes for different sized dogs. Dogs love squeaky sounds and that’s why many dog toys squeak! Sometimes, however, the constant squeaking can get a bit annoying for any dog owner no matter how much fun Fido is having. Enter the Ultrasonic Silent Squeak Plush Toy. This genius toy uses science to create a squeak that only your dog will hear, leaving you with a squeak-free house and more importantly, a happy dog. The cute plush toy squeaks at a 28 KHz frequency, outside of the human range but well within the range picked up by canine ears. 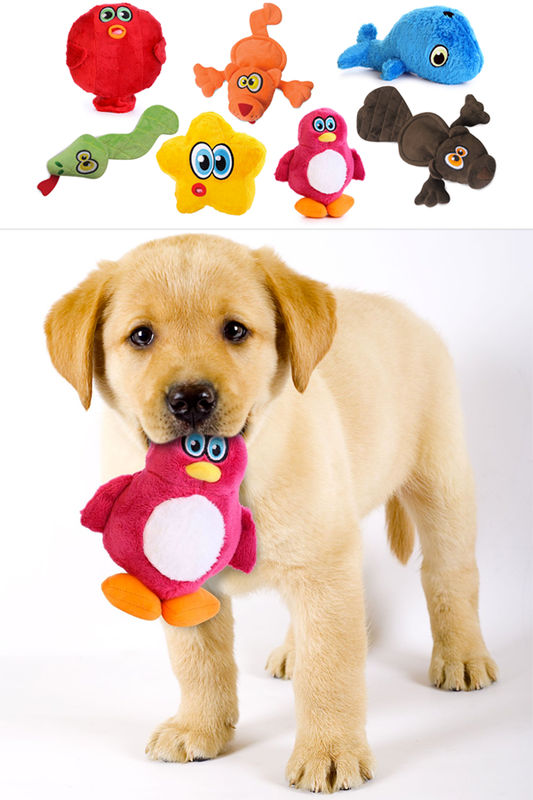 Grab one of these adorable plush toys and keep both you and your pup happy! Choose from a variety of animal designs including: brown beaver, penguin, snake, starfish, whale, cat, and more! The KONG Wobbler is easily one of the most entertaining toys and treat dispensers that you can get for your dog! 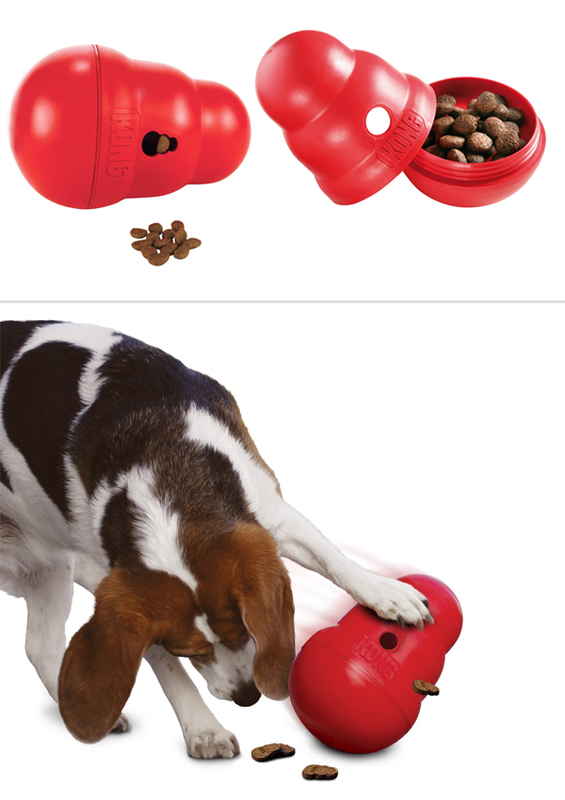 Fill the wobbler up with your dog’s favorite treats and set it on the ground. Watch your canine push it down as it wobbles and rolls and lets out the treats. Not only does this make for a unique alternative to a bowl for feeding your pooch, but your dog will also get some exercise during meal time! What’s cute, amusing, and won’t get shredded to pieces by your dog? The Plush Puppy Gator Squeaker Mat! 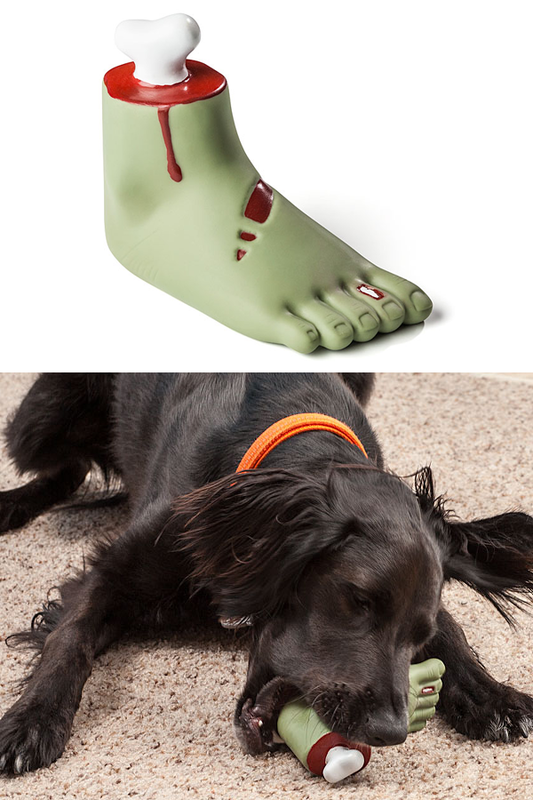 This durable toy will provide your dog hours of squeaking, cuddling, and shaking. The mat contains 32 squeakers, which means if one breaks, your dog will still have many more left to play with. Once your dog pops all of the squeakers, the toy can still be used as a blanket or pillow by your pet. 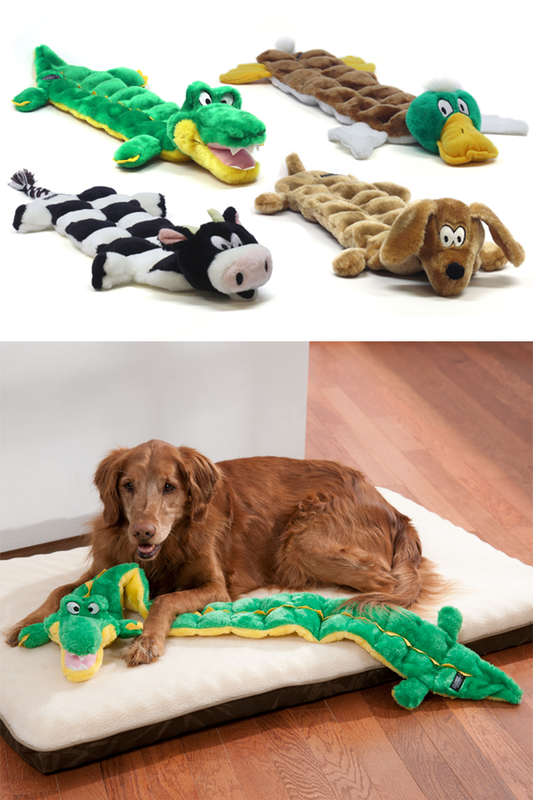 Also available for $9.99 are a dog, gator, and mallard design and for $7.94 a cow design plush toy with 16 squeakers. Get them all here . Activate your canine’s instinctual nature with this interactive reverse puzzle! 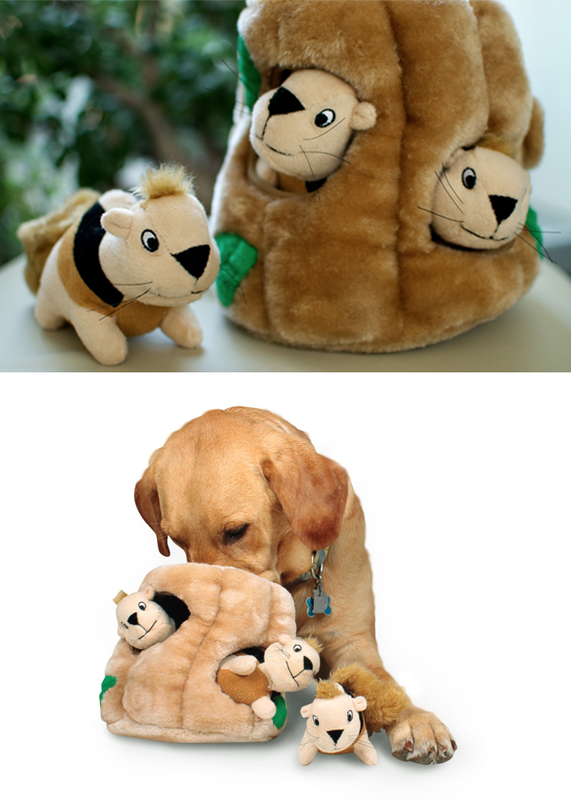 Stuff each individual squirrel pieces into the plush tree trunk and watch your dog sniff them out! Once they are done, stuff the squirrels back in and watch your dog play again. The squirrels squeak, which will keep your pet entertained for hours. Not only is this puzzle incredibly engaging, but it can help improve your dog's problem solving skills and I.Q. On atmost20, we aim to find great items you or a friend might like and our ultimate goal is to keep the price of those items under $20. However, the item below with a sticker price of $32.96 was just too cool not to include in this roundup of items for your (or a friend's) dog! 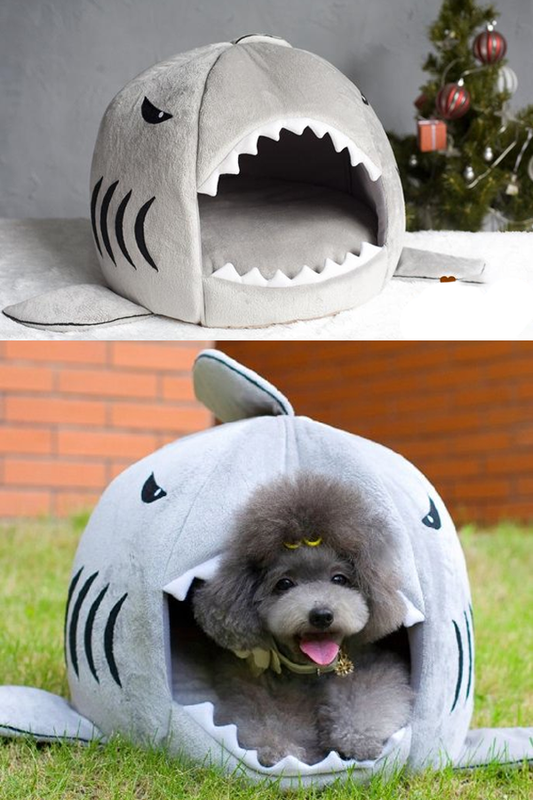 This adorable pet house is shaped like a shark and provides a soft and comfortable mat for your pooch to sleep on. Watch your dog crawl in with excitement and lay down to relax and escape for the day. After all, pets need a vacation house too! And to top it all off, a smile on your face will follow soon afterwards at the sight of your pup inside the mouth of the plush shark. Superfine fiber used for this house is easily washable in the machine. Suitable for medium dogs weighing up to 20 lbs.